Just finished building my enlarged A2 size SKY BUG - yet to be painted in bright orange acrllyic. 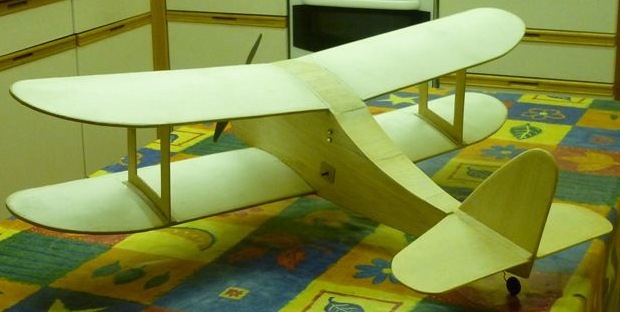 SKY BUG wing construction is of Jedelsky balsa ribs on a depron wing former with a single composite pianowire "I" box basswood centre spar. All depron wings are covered in light weight nylon using Ronseal water based floor varnish for the stressed skin strength. 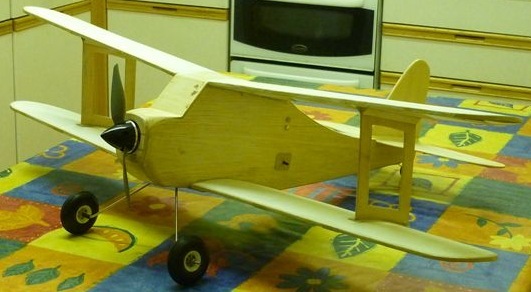 The fuselage is of conventional balsa construction with formers. At 39 " wingspan and 28ozs AUW my math tells me it has a wing loading of 10 ozs/square foot so it should float ok. I will be test gliding tommorow to see how it goes in preparation for Electric Bowden type events at Barkston. Powerplant is a Robotbirds outrunner part ref:409681 - a A2822-17 1100kv brushless that costs only £7.95. I am using a 8x6" electric APC prop to give 360 grams thrust at 8amps on 3 cell lipo 800ma battery pack. Control is via my home built 3gram servo tester and PBORO MK4 FET timer uprated to 100seconds duration.